But you can preview Janna right now in her sizzlin' Members Corner pictorial. 9th LA Calendar Motorcycle Show Huge Success! 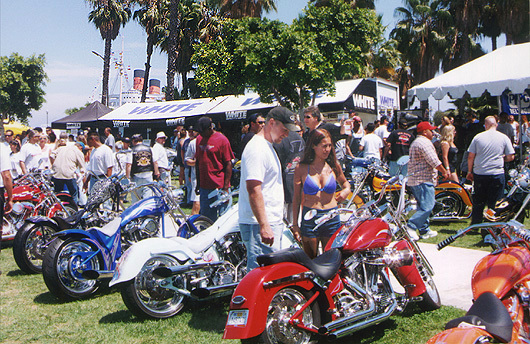 The 2000 LOS ANGELES CALENDAR BIKE SHOW Blows the Lid Off! Long Beach CA, Sunday July 23th: Our Hot Bike presents The White Brothers 9th Annual Los Angeles Calendar Motorcycle Show premiered at the Queen Mary Event Park for the first time this July and we blew the lid off. We had a record 95 Manufacturers attending with the biggest and best in America including American Honda, Yamaha, Ducati, Indian, Titian, Ultra, Confederate, Pro One, Drag Specialities, plus all the top aftermarket component companies including Performance Machine, Vance & Hines, Jim's Machine, Edlebrock, Storz, Mikuni, STD and much more. More Exhibitors than any 1-day streetbike event in America! Plus the top custom bike builders in America including West Coast Choppers, Paul Yaffee, Harold Pontarelli, John Covington, Russ Tom, Al Martinez, and Best of Show winner Steve Frasco's Matt Hotch built Hot Match Choppers. And the fans turned out in record numbers with a 30% increase in attendance again this year! Some 10,000 streetbike fans made it into the Calendar Bike Show for a day filled with exciting entertainment ranging from the best Custom Bike Show on the West Coast to The White Brothers West Coast Horsepower Dyno Shootout, live retro disco music from Night Fever with on stage ceremonies hosted by famed announcer Larry Huffman, to a roaring world record holding Top Fuel Vance & Hines Harley drag bike ridden by Doug Vancil. One of the many other intersting attractions included the opportunity to sign up for Adult Film vacation in Cabo San Luca, Mexico, with famed adult film star Houston (regularly featured on the Howard Stern Show) who was on hand to promote the vacation and autograph pictures. As always, The LA Calendar Bike Show was the premier of the new season's FastDates.com motorcycle pinup calendars including the Mikuni Iron & Lace Custom Bike, the White Brothers Berm Busters motocross calendar, and the World Superbike Fast Dates Racebike Calendar. Beautiful calendar models Tiffany Gramaza and Allison McCurdy were on hand to personally autograoph their pages in the new calendars. to accomodate your increased attendance. Thanks for your support! Bike Show Contest Results at bottom of this page. For Additional 2000 Bike Show Coverage and Photos CLICK HERE . Doug Vancil fires up his world record holding, 6.45@219 mph, Vance & Hines top fuel Harley. If the ear shattering noise didn't get you, the eye buring nito methane did. Awsome!